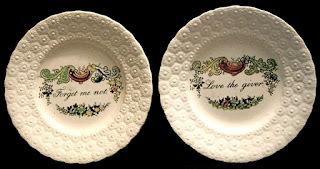 Dishy News - A Transferware Blog: HAPPY VALENTINE'S DAY! In general, probably 99.9% of small plates with a molded border were intended for children. However, the two seen here look more like love tokens. Let me know what you think. "Forget me not" and "Love the giver"
These plates are poorly printed, but the sentiment is rich. They have been treasured for more than 150 years.